A friendly, close-up view of Montclair, New Jersey, soccer moms who became soccer-playing moms and discovered the joys and anguish of participating in a team sport. New York Times sports columnist Araton lives in Montclair and is the husband of one of the women recruited in 1998 to join a beginners’ soccer group. Sports-loving physical therapist Lisa Ciardi rounded up enough other interested mothers to convince the operator of Ashley’s Soccer Camp, a local soccer program for kids, to begin offering training for women. 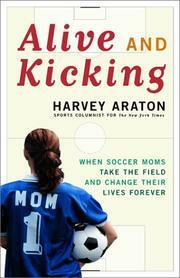 Araton follows the soccer moms’ evolution from a friendly little group to a league of competing teams. Publicity brought in new players, including younger women whose school athletic programs had benefited from Title IX, the 1972 federal legislation guaranteeing equal athletic access for girls. As the more competitive, more aggressive younger women changed the game, Araton observes the varying reactions of the older moms. To provide some perspective on the issue of women’s attitudes toward competitive sports, he looks briefly at another group, suburban D.C.’s Mothers of Basketball, which forbids score-keeping, and at a couple of more established female soccer leagues in other cities. While Araton emphasizes the perceptions and experiences of the women themselves, he also notes the reactions of various husbands as soccer makes increasing demands on their wives’ time and attention, even on the family’s financial resources. Perhaps because he is a sports columnist, Araton devotes considerable space to individual games and to the personalities and performances of specific players, details that require substantial knowledge of soccer to fully appreciate. Falls short as an examination of women’s attitudes toward sports, but with its enthusiasm for the game and its positive portraits of the players it may well please soccer fans.